13 Mar 2019 – The bell rings and the halls erupt with the sounds of chatter and excitement as hundreds of children run to the dusty courtyard for recess. I joined them to play football but the game instead turned into a round of questions. Where am I from? I’m from Belgium. But I know that if I asked this question to some of these children, their response wouldn’t be so simple. This Friday [15 Mar] marks the ninth anniversary of the start of the Syria crisis and, with an average age of around 9, many of the refugee children I spoke to would have a very limited recollection of life in their home country. Some would have no memory at all of their homeland. “I have 693 kids in the morning and 836 in the afternoon” said M. Samia, Director of Abra intermediate school in the governorate of Saida, southern Lebanon. Samia and his team explained that, in Lebanon, the schools have a first session in the morning for Lebanese children, and a second session in the afternoon for Syrian refugees. “We’re very proud to be one of the schools working with the World Food Programme (WFP) and the Ministry of Education for the school snacks programme,” he said. Each day, the children receive a healthy snack such as nuts or fruit and some milk. Overall, WFP’s school feeding programme reached nearly 1.5 million children across Syria, Jordan, Lebanon and Egypt last year. For most of us, it is difficult to understand what it must feel like to be uprooted by conflict. To flee bullets and bombs and leave behind a life, a house, a job, a family, friends, school…. It is estimated that more than 11 million Syrians have left their homes since the beginning of the conflict. Some of them have fled to Europe but many of them – more than 5.6 million – are registered with the UN in what is called the Syria + 5 region, which includes Turkey, Jordan, Lebanon, Iraq, and Egypt. 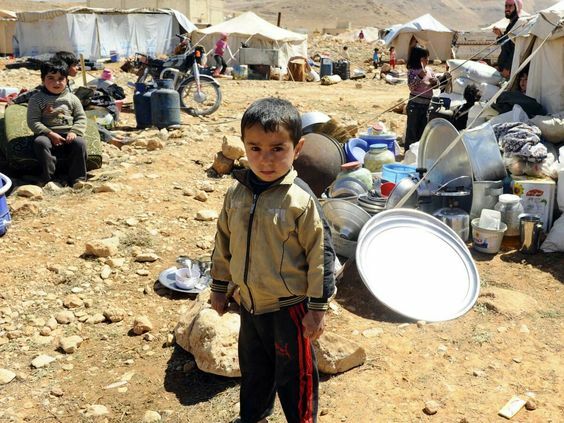 More than 6 million people remain internally displaced within Syria. The Syrian conflict continues to drive the largest refugee crisis in the world, and WFP and partners are committed to supporting them in whichever countries they find themselves. Within Syria, WFP feeds 3.5 million people every month. In the +5 countries, WFP assists 3.3 million Syrian refugees with a combination of food assistance and cash-based transfers. Most of the refugees in neighbouring countries do not live in formal refugee camps. Instead, they are interspersed throughout towns and cities. Cash-based transfers, which enable them to make choices about what they eat, have injected more than US $2 billion dollars into the local economies of Turkey, Lebanon, Iraq, Jordan, Egypt and Syria since 2012. In Turkey – which hosts over 3.7 million Syrian refugees – WFP and partners support refugee families living outside camps with a debit card loaded with cash each month. This is known as the Emergency Social Safety Net or ESSN programme. The ESSN has reduced by half the number of refugee parents withdrawing their children from school – and it has also led to many fewer parents cutting meals so their children can eat. After nearly eight years, many Syrian refugees wish to return home and end the cycle of navigating unfamiliar lands, languages, and cultures. In these cases, any return or relocation must be voluntary, safe, dignified and well-informed and in line with minimum protection standards. For those who do want to go home, most have no houses or jobs to return to – nor do most of them have the means to feed or educate their children. Syrians returning to their country and communities need support – and they need to work. Unemployment is running at 50 percent overall and is as high as 80 percent among young people. WFP is helping Syrians produce their own food and generate incomes in areas that are secure where markets are functioning. More, however, needs to be done. The economy needs to be rebuilt. In the meantime, we need to maintain the vital lifeline of food assistance on which millions of vulnerable Syrians depend. For this to happen, WFP needs an additional US$116 million from now until June 2019. As for my friends at Abra intermediate school, I hope that they can continue their education so that one day they may realize their potential. I hope they can overcome the all the suffering they have experienced. I hope that someday soon they can get to know their country so in the future, if someone asks where they are from, they can give a ready answer. *The third Brussels conference is currently underway, through March 14, on ‘Supporting the Future of Syria and the Region’, and the 9thanniversary of the Syrian conflict falls on Friday, March 15th. Herve Verhoosel is senior spokesperson for UN World Food Programme.